Labor Day has come and gone. Shocking but true! Where does the time go? It’s also the unofficial end of boating season. Many boaters also target Labor Day weekend as the right time to take their boat out of the water before the cold weather hits. To prevent the spread of zebra mussels, spiny waterfleas, faucet snails, or other prohibited invasive species, the Minnesota DNR is reminding boaters and anglers to continue to take extra precautions when removing their watercraft or water-related equipment out of the water for the season. They should be sure to inspect it and see if aquatic invasive species are attached. People should look on the posts, wheels and underwater support bars of docks and lifts, as well as any parts of boats, pontoons and rafts that may have been submerged in water for any extended period. In newly infested waters, adult zebra mussels may not be abundant, so there may only be a few mussels on a piece of equipment. If you are a water recreationist (boater, angler, water-skier, sailor, Jet Ski user or canoeist) there are some important things you can do to prevent the transport of harmful invasive species from one lake or river to another. In Minnesota it is illegal to transport aquatic invasive species. These mussels encrust docks and boats and attached mussels can increase drag on boats. Small mussels can get into engine cooling systems causing overheating and damage. 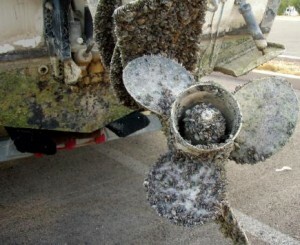 Increased hull and motor fouling will result in increased maintenance costs on vessels moored for long periods of time. The weight of attached mussels can sink navigational buoys. Zebra and quagga mussels also impact fish populations and reduce sport-fishing opportunities. Their sharp shells can cut the feet of swimmers, beach goers, and dogs. Remember that watercraft and all water-related equipment can spread AIS. This includes fishing boats, jet skis, wakeboard boats, sailboats, scuba gear, float planes, canoes, kayaks, all fishing gear, waders, docks, boat lifts, moorings, and waterfowl hunting gear. We need everyone’s help to protect the lakes, rivers and streams that we all cherish! Do your part to Help protect Minnesota’s waters from invasive species! Remember to Clean, Drain and Dry!